March flew by in a whirlwind of yellow pollen. To some, it felt like we skipped spring and went straight into summer. I admit that after turning on the heat a few times in February, the switch flipped directly to air conditioning by the second week of March. In addition to dealing with the sudden onslaught of pollen, I bounced around the local area, talking to students about severe weather safety. Though my favorite presentation in March, involved teaching kindergartens the Water Cycle Boogie. So with that, here are a few of the comments that caught my attention in March. FL-PB-9 on 3/1/2015: "rain started a little before noon and lasted until about 5:45 pm with a few light showers after that. between noon and 2:00 the rain was torrential. after that the rain became lighter but still mixed with heavy downpours." FL-GL-13 on 3/12/2015: "Last observation until about October." 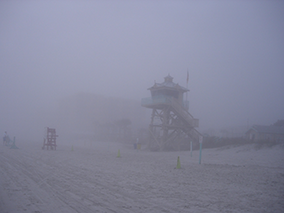 FL-VL-32 on 3/24/2015: "Poor Beach Day - Sustained 15 mph northerly winds an resultantly 'light' blowing sand under heavily overcast skies with fog/mist (vis > 1/2 mile)." FL-SL-33 on 3/27/2015: " Partly cloudy during day, more overcast towards afternoon. Strong winds from the west bringing abrupt rain. Temporary though noticeable ponding of water in swale and road intersections in some areas. Draining over a period of 2-3 hours (no damage)." FL-HL-2 on 3/30/2015: "Last crisp morning of the year here @ 36.8 F. What a treat for the end of March! Summer returns tomorrow morning with temps 25 degrees warmer." 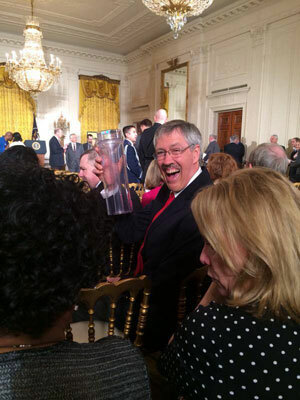 Yes, it's official: There is a CoCoRaHS gauge at The White House. Yes, THE White House! On March 23rd, DC-DC-19 came online on the same day The White House hosted the fourth annual White House Science Fair. The gauge has been carefully installed, leveled and bevelled in the First Lady's Kitchen Garden. 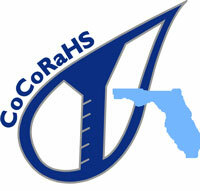 Not only was this a huge accomplishment and honor for CoCoRaHS, but this was a wonderful way to put the spotlight on the importance of education through citizen science. 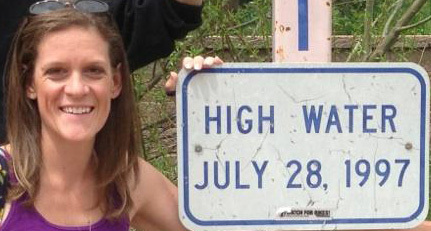 Nolan was there, trusty rain gauge in hand, to take part in the ceremony. 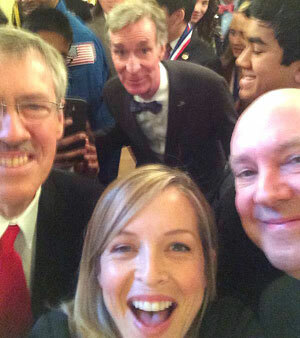 By the looks of the pictures, it was a great event... and it's not every day you say that Bill Nye the Science Guy photobombed you at The White House. 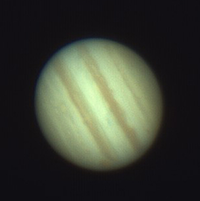 This month, Ric shared some stunning pictures he'd taken with his Celestron telescope of Jupiter. The first picture was taken on a clear night on the 4th of March. The second one was taken on the 12th. He mentions that by watching the bands and how they move and change on the face of Jupiter, you are making weather observations. 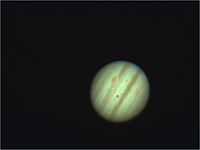 The second picture shows the 'Great Red Spot' and the black dot is the shadow from one of Jupiter's moons. 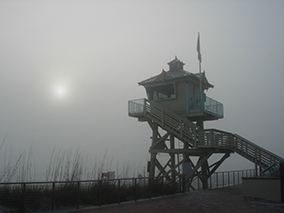 Carol was also kind enough to send some beautiful pictures of fog on New Smyrna Beach from early this month. Rainfall totals were well below normal across the state in March. 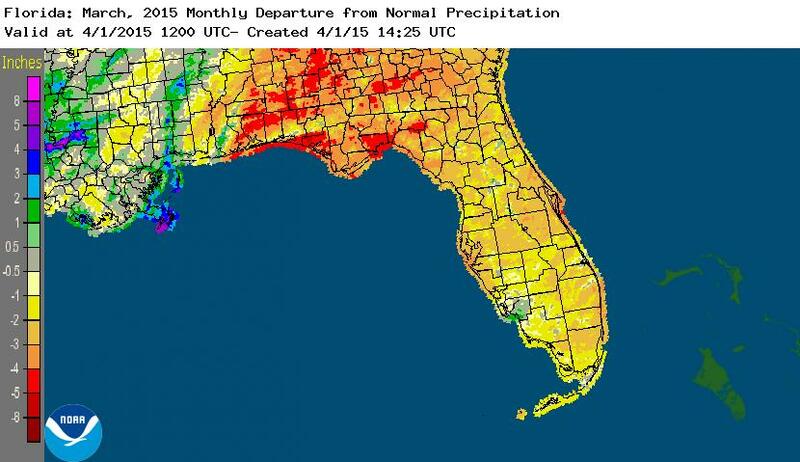 With the exception of Lee County, FL, the entire state had rainfall totals below normal (Figure 1). 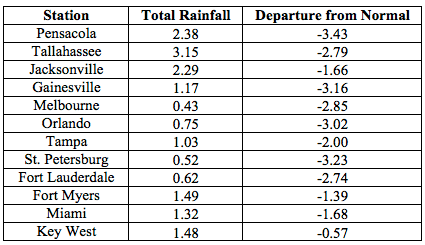 Departures from normal roughly ranged from -0.57" to -3.43" (Table 1), though localized parts of the state saw rainfall totals that were as much as 5.00" below normal (Figure 1). 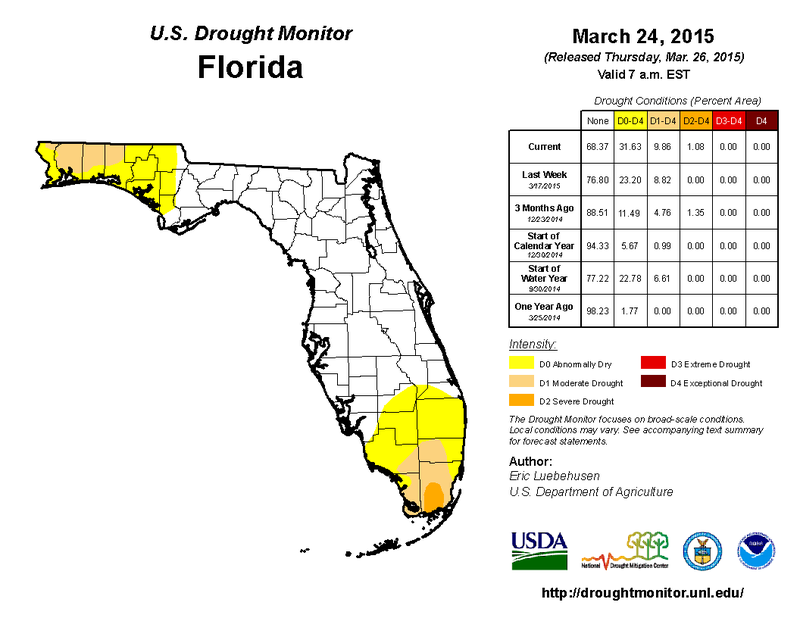 March 2015 was the 9th driest March on record for Daytona Beach. A significant rain event took place in Walton, Okaloosa, and Washington counties on the 22nd, where some locations along the coast picked up over 5.00" of rain. Despite the fact that rainfall totals across the state were below normal, there were multiple 24-hour precipitation records broken for the month (Table 2). Table 1. 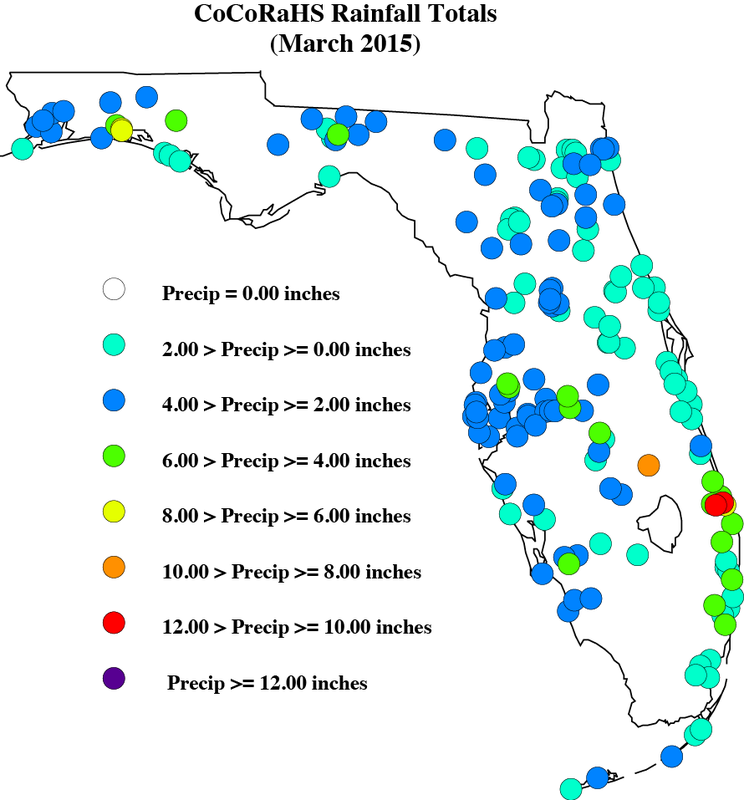 March precipitation totals and departures from normal (inches) for selected cities.